Our tours are history based provided by a passionate and experienced guide. These are not your boring scripted tours, each guide has an interesting perspective of the local history and they enjoy sharing theories on short breaks from riding around town. You will enjoy the control of the two wheeled marvels within the Segway. Our tours are a story mixed with current day happenings while we enjoy the outdoors together. Expect to get a close up look at the State Capitol of Texas, the Driskill Hotel and the Paramount Theater on Congress Ave. 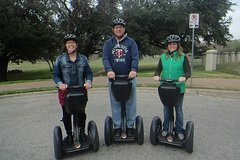 This experience will have you wanting one of two things: a Segway of your own and more time to ride around.